So smartphone in hand I took this shot of the rig I use to level and square-up the head and end-blocks. 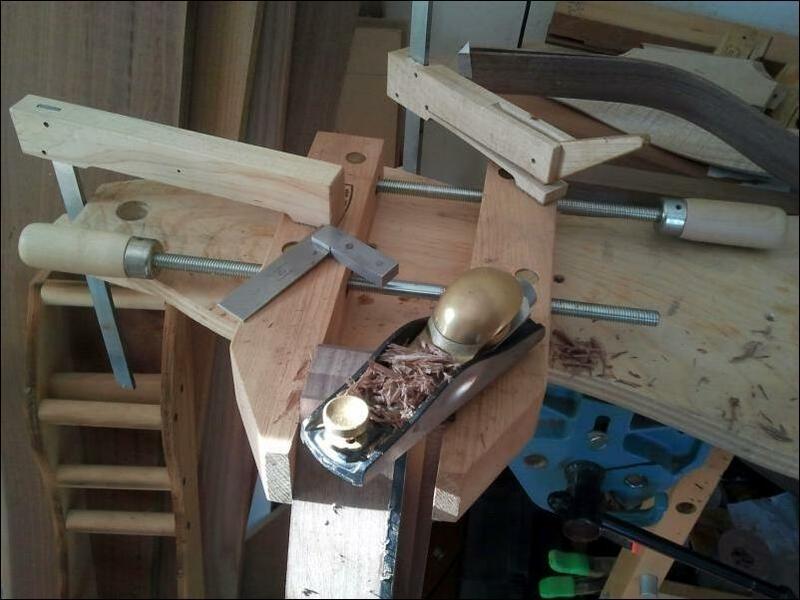 With the dulcimer firmly mounted in the cabinetmaker’s clamp I use a low-angle block plane to level the block where the fretboard, binding, soundboard, back and sides come together. This area of the dulcimer has various parts converging at different angles and the grain is running in all directions. There are also areas where delicate edges could easily get chipped. If these edges get chipped they would look painfully obvious on the finished dulcimer. I keep the low-angle block plane sharp and set it for a very light cut. The sides, binding and fretboard have already been cut almost flush with the head-block using a saw. This still leaves a bit of overhang that require leveling. I plane these areas from the outside edges towards the center of the block as this prevents chipping. Once these parts are level to the block I make several passes with the plane to assure the entire surface is flat. I check the flatness of the block using the machinist’s square in the photograph. On a good day the task is complete and I start preparing the peghead assembly for gluing to the body. On other days I lather, rinse, repeat a few times till everything is right. I could just go to the basement and fire up the disc sander I bought a few years ago but what would be the fun in that? It would be loud and messy and not nearly as much fun as doing it by hand. If I include the time of going downstairs and back upstairs it doesn’t take me much longer to do it by hand anyway. I’m going to clamp down on the overuse of clamps! LOL Thanks for the entry, Doug! You need not do anything. Remain sitting at your table and listen. You need not even listen, just wait. You need not even wait, just learn to be quiet, still and solitary. And the world will freely offer itself to you unmasked. It has no choice, it will roll in ecstasy at your feet.